Successfully Added Huawei Honor 8 Android Phone - Dual-IMEI, Android 7.0, 1080p Display, 4GB RAM, Octa-Core CPU, 12MP Dual-Camera (Black) to your Shopping Cart. The Huawei Honor 8 is a powerful Android phone that is capable of bringing forth an extraordinary performance. With its Octa-Core CPU that is capable of reaching clock speeds up to 2.3 GHz, it is guaranteed that this Android smartphone allows you to enjoy the latest and most demanding software features at ease. The mobile phone furthermore holds a stunning 4GB of RAM thanks to which you’ll be able to multitask and use all this cell phone has to offer without dropping a frame. Spoiling you with 64GB of internal storage and a 128GB SD card slot, you can be guaranteed that this Huawei phone packs all the necessary storage space for all your files and media. Within its stylish and sleek body, this Android phone holds an eye-catching 5.2-Inch display that portraits movies, games, and applications in stunning beauty. Bringing forth 1080p resolutions, you can be assured that this mobile phone treats you with an exceptional media experience wherever you are. 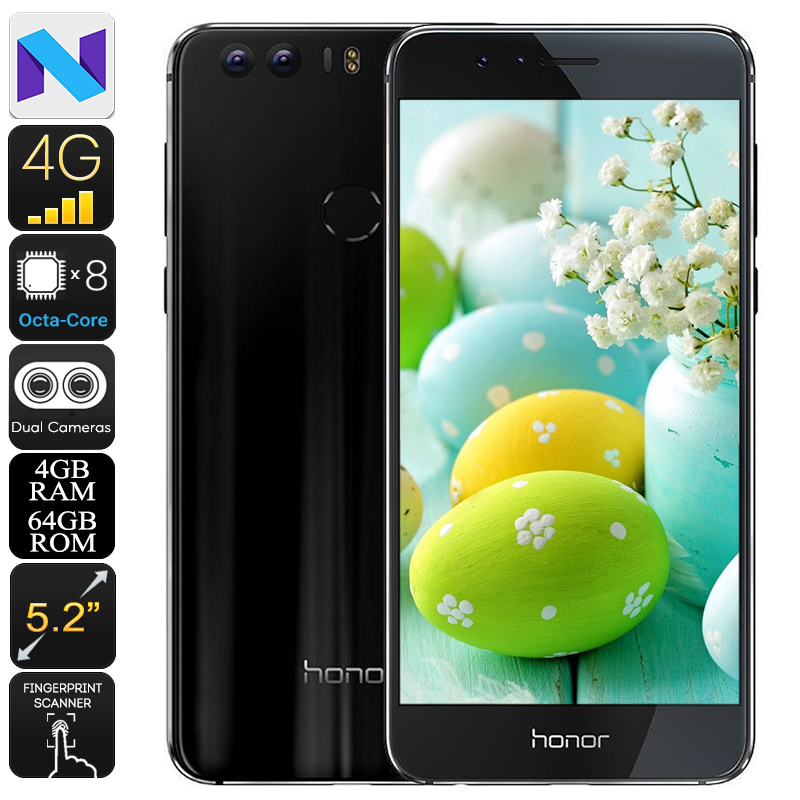 Supporting OTG, the Honor 8 allows you to attach external hardware devices such as a memory stick or game controller to your smartphone – bringing along plenty of other opportunities to enhance your overall user experience. Supporting Dual-IMEI numbers, this Android phone lets you be reachable on two phone numbers while using merely one device. This makes the cell phone perfect for those of you that often travel abroad or wish to separate work and private life in one Android device. Additionally, it also comes with 4G and Dual-Band WiFi, bringing along ultimate connectivity no matter where you’re at. With its 3000mAh battery in place, this Android phone treats you with up to 5 hours of continuous usage time. As a true flagship smartphone, this stunning Android device packs a breathtaking Dual-Lens rear camera. This 12MP snapper features a monochrome lens and a color lens – truly allowing you to take your photography skills to the next level. Additionally, it features an 8MP front cam that can be used perfectly for snapping selfies with friends and family or for engaging in online video calls. With this Android phone at your side, you can be guaranteed that not a single memory in life ever again stays uncaptured. The Honor 8 comes with a 12 months warranty, brought to you by the leader in electronic devices as well as wholesale electronic gadgets..